New figures show impact of Crossrail on jobs and growth around the UK - Crossrail . For information about the Elizabeth line please visit the Transport for London website. The stimulus that Crossrail is providing for job creation and growth in the UK’s regions and nations is revealed by new figures showing that more than half of the project’s supply chain spend is taking place outside London. Expenditure in the supply chain was estimated at £865m, of which £460m (53%) was spent outside London. London’s new east-west rail link, which will include the construction of 26 miles of tunnels under the capital, is Europe’s largest infrastructure project and on a scale nearly twice the size of the London 2012 Olympics. Over the entire course of the project, it is estimated that Crossrail and its supply chain will create at least 75,000 business opportunities and support the equivalent of 55,000 full time jobs across the UK. More than three in five (62%) businesses currently winning work are based outside London and over half (58%) are SMEs. With Crossrail now entering its peak period of construction, the project is starting a major push to raise awareness of the opportunities that will arise for UK firms of all sizes over the next few years. Crossrail will require goods and services from a wide range of sectors as the project’s focus moves from tunnel construction to station and tunnel fit-out. The company has embarked on a series of events around the country to encourage businesses to seize the opportunities that the project will generate, beginning recently in Northern Ireland. Click here for a list of case studies from all the UK’s regions and nations of businesses that already have won work on Crossrail. 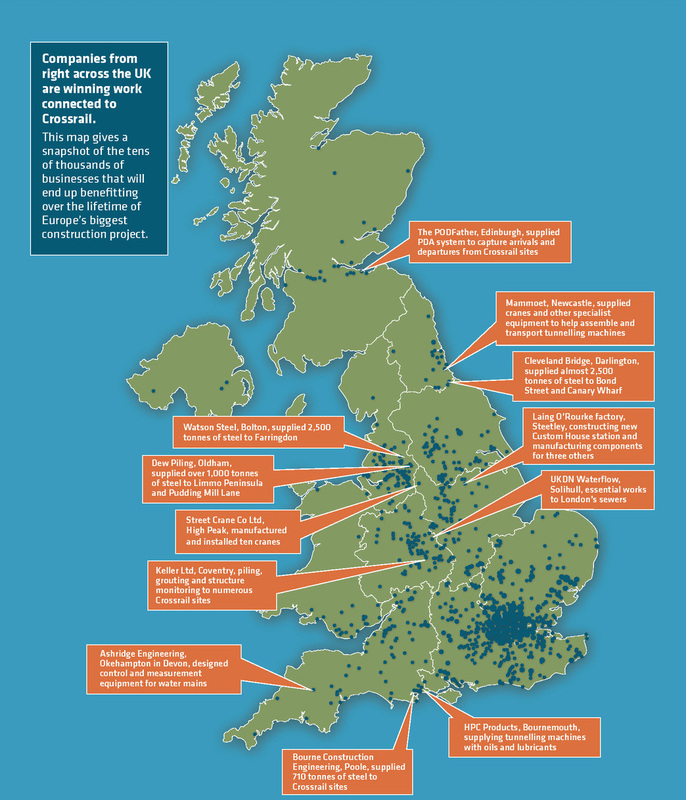 Click here for a map showing businesses that have won work on Crossrail. Regeneris Economics Research Analysis was commissioned to consider the impact of Crossrail’s supply chain on the UK. Crossrail provided all spend at tier 1 level over £50,000 and critical contracts at tier 2 and tier 3. Once double counting had been removed, total supply chain expenditure was calculated at £865m in 2012/13. Renegeris used this information and the location of suppliers to locate total expenditure and FTE figures. As only critical contracts were monitored at levels two and three in the supply chain and only contract values over £50,000 were included in the study, it is likely that the actual impact of Crossrail is even larger than the estimates suggest. Note: Expenditure and GVA expressed in 2012-13 prices. Crossrail has issued a three point plan for businesses looking for work on the project. Sign up to the CompeteFor website, a website which automatically matches suppliers to opportunities that suit them. Go to the suppliers section of the Crossrail website where they can see the latest summary of all the direct contracts awarded.